The siren sounds on the Cats 2012 season, as they fall short by 16 points to the Dockers. The Dockers will take on the Crows next Friday night. BEHIND CATSTaylor marks 40m from goal on a slight angle, he takes the kick and misses. FREMANTLE ARE HOME! Last roll of the dice for the Cats with just one minute and fifteen seconds left. The ball is in the Cats 50. The Cats need three goals to win the game, with just two minutes left on the clock. Pavlich marks 45m out on a slight angle, he runs in to kick for goal and puts it out on the full. GOAL CATSHarry Taylor is held onto 30m from goal directly in front. He kicks it through for a goal. The Cats trail by 17 points once again. The equation is this for the Cats: Kick four goals within four minutes or their season is over. GOAL DOCKERSMayne creates the loose ball for Pavlich, who roves it and kicks it through for goal number six. GOAL CATSJosh Hunt is taken high and is awarded a free kick, Fyfe does not give it back quick enough, 50m penalty. He kicks a goal. The Cats are back to within 17 points. We are down to the final five minutes of regular time in the game. The Dockers are using up as much time that they can off the clock. BEHIND DOCKERSWalters is taken high 20m out directly in front, he comes in and pushes it away to the left. Geelong need a goal and they need it now, with eight minutes of regular game time left on the clock. BEHIND CATSThe ball comes off hands and through for a rushed behind. Duncan was taken high but the umpire does not award the free kick. The Cats probably can't afford another Dockers goal at this stage of the game, if they want make up some ground on the scoreboard. GOAL CATSJosh Hunt gathers it from outside 50, he roosts it long and it is through. The Cats are back to within 23 points. The J Pod is playing on the Big Friendly Giant, Sandilands who is playing at full forward. GOAL DOCKERSWalters hands it over the top to Ballantyne in the goal square and he kicks a goal to steady the Dockers once again. SUBSTITUTION DOCKERSThe Dockers have activated their sub, Suban in place of Spurr. BEHIND CATSDuncan comes out and takes an overhead mark 48m from goal, he hands it off to Josh Hunt who hits the post. GOAL CATSChristensen marks 45m from goal directly in front, he kicks for goal and puts it through. The Cats are back to within 24 points. BEHIND CATSThe ball goes through the hands of Vardy and through for a rushed behind. The Cats trail by 30 points. BEHIND CATSMotlop takes it off hands, gets it off to Stokes, who has a quick shot from just outside the goal square, but he misses as he is dragged down, as he was kicking the ball. The Cats are starting to rise in confidence, they need a couple of quick goals to get them back into the game. GOAL CATSMackie steals the ball away from McPhee, kicks a low bouncing ball for goal and it goes through. The first goal of this term will be vital in terms of momentum for either side. The ball is bounced in the middle to start the final term. The Dockers go into the final break holding a 38 point lead over the Cats. One of these teams will bow out for season 2012, the other will have increased their premiership chances. BEHIND DOCKERSBallantyne gets to the fall of the ball from 60m out, he looks for a pass and finds Mzungu. He comes in and pushes it away to the right. An interesting stat is that the Cats have had 64% of the ball this quarter, yet they are trailing the Dockers for the term by three points. Dawson gets the front position from Hawkins, just as the Cats were looking dangerous. BEHIND CATSSimpkin goes short and finds Duncan on the end of the pass 45m from goal. He takes the set shot and he pushes it away to the right. BEHIND CATSHunt goes short to Lonergan, who marks 25m out but on a steep angle. He hits the back of the post. Geelong need to kick a couple of unanswered goals before the final break, to give them a chance for the final term. GOAL DOCKERSDe Boer gives it to Walters, who has a ping at goal and it bounces through. The Dockers are probably a couple of goals away from sealing the game. The Cats now need to stand up. They haven't been able to cut the Dockers first quarter lead down by too much before the Dockers reply to restore the status quo. GOAL DOCKERSBallantyne closes in on the 50, he runs to 40m out and lets loose with a great running goal. Dockers lead by 33 points. The Dockers will not back down here, they have been able to steady every single time that the Cats start to look dangerous. GOAL DOCKERSPavlich gathers it on the boundary, he looks for a pass, but can not find anyone to give it to, he decides to go for home and kicks his fifth. Kelly has been reported for head high contact on Mzungu. SUBSTITUTION CATSMurdoch has been subbed out of the game for the Cats and Simpkin has been activated. GOAL CATSHawkins centres it for Vardy who marks 45m out with no relative angle, he comes in and floats it through for a goal. BEHIND DOCKERSTaylor kicks it away from defence, but he doesn't clear the man and Ballantyne marks. He goes to De Boer who marks 30m from goal. He comes in and misses from directly in front. The Cats need to answer, to keep up their hopes and regain the momentum. GOAL DOCKERSPavlich takes the mark on the chest, 40m from goal directly in front. He kicks his fourth goal of the game. GOAL CATSStokes gathers it off hands, he kicks it low and it bounces through for a goal. The Cats are back in town! BEHIND CATSWest punches it away from the Dockers defenders, but the ball bounces towards goal and hits the bottom of the post. BEHIND CATSChristensen is pulled down by Fyfe and he is awarded a free kick 40m from goal. He kicks it across the face of goal. GOAL CATSPodsiadly gets out the handball over to Motlop, who runs into the open goal and draws first blood for the Cats. We are back for the second half of the match, as neither team are able to take the clearance away. The Dockers go into the main break holding a 34 point lead over the Cats. BEHIND CATSMackie from a standing start goes for home but it starts left and it stays there. 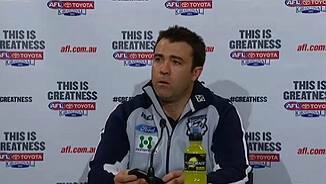 There is still enough time left for a late Geelong goal if they are good enough. Selwood is the leading possession taker on the ground with 13 touches. The best for the Dockers is Mundy with 12 touches. GOAL DOCKERSCorey with the fend off but he gets caught, the ball spills free and Walters soccers it through off the ground for a goal. The Dockers steady the ship. Suddenly all the Cats champion players are getting into the game after barely being seen for a quarter and a half. GOAL CATSDuncan runs with the flight of the ball and takes the mark on the edge of the goal square. He runs around the mark and goals. The Cats are back to within 29 points. GOAL CATSSelwood is taken high 30m out with no angle, he comes in and splits the middle. Is this the start of the fairytale comeback? 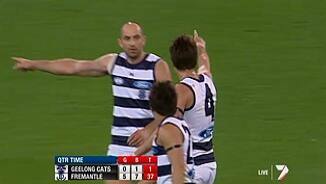 Geelong look like they have finally found their mojo, as they look like the Cats of old. GOAL CATSCorey marks 45m from goal directly in front, he is accidentally poked in the eye. Mackie takes the kick on goal and final kicks the first major for the Cats. BEHIND CATSBartel roosts a shot for goal, it falls short and off hands it goes through for a point. GOAL DOCKERSPearce marks 48m from goal directly in front and Pearce kicks a rippa, to give the Dockers a 48 point lead. The good news for the Cats is that they are starting to see more of the ball in their forward line, but they are still yet to kick a goal. BEHIND CATSPearce takes Stokes high 50m from goal, the umpire spots it and awards the free kick. Christensen takes the kick as Stokes is winded. He kicks a point. BEHIND CATSHawkins marks on the boundary 45m from goal. He takes the kick as he attempts to swing it around, but can only manage a point. Mackie runs off the ground to receive treatment on his left knee. He should be fine to continue. GOAL DOCKERSDe Boer marks 35m from goal directly in front, he kicks it through for a goal. The Dockers lead by 44 points. The Dockers have had 11 marks inside their attacking 50m, whilst Geelong have not had a mark inside their attacking zone. A damning stat for the Cats. BEHIND DOCKERSBarlow marks 40m from goal on a slight angle, he comes in and kicks it away to the left. The Dockers need to make the most of their chances in front of goal. Hawkins is on a lead and has the ball punched away from him and over the boundary for a throw in it goes. BEHIND DOCKERSBallantyne gathers the loose ball, has a quick shot on goal and pushes it away for a point. The second term has started off pretty much where the first term left off. The Cats forward entries can be described as clumsy at best. Every time they have gone inside their 50, they have just kicked it to a Fremantle player. The second term is under way, the Cats will be hoping to score their first goal of the match in this term. The siren sounds to end the first term and the Cats go into the break shell shocked and trailing the Dockers by 36 points. BEHIND DOCKERSHill gets it 70m from goal, runs to the 50m line, puts it onto the left boot and pushes it away to the right. Everything that can go wrong is going wrong for Geelong tonight, as West kicks it into the man on the mark. We could well be witnessing the end of team Cats' dynastic era here tonight. BEHIND DOCKERSFyfe goes around the corner and he hits the post. BEHIND DOCKERSMzungu is unable to take the mark in the goal square as he knocks it through for a rushed behind for the Dockers. Fremantle lead by 33 points. GOAL DOCKERSPavlich comes out and takes the mark 35m from goal directly in front, he kicks it with ease and makes it goal number three for the night. The equation is simple for the Cats, a win and they play on next week against the Crows, a loss and their season is over. BEHIND DOCKERSJohnson marks 40m from goal near the boundary, he goes for goal and is offline. BEHIND DOCKERSWalters chips in and takes the mark 30m from goal on a slight angle, he shoots for goal and misses away to the right. BEHIND DOCKERSHarry Taylor does the team thing and knocks the ball through for a rushed behind for the Dockers. GOAL DOCKERSPearce goes short to Crowley and gets him 45m out on a tough angle, he kicks it straight through the middle. GOAL DOCKERSBallantyne takes the mark 40m from goal, he takes the set shot on goal and puts it through. The Dockers are on fire! The Cats will need to readjust their planning at quarter time, as it is clearly not the right game plan for tonight. GOAL DOCKERSPavlich takes the contested mark, he plays on and kicks a great goal. The Dockers lead by 11 points. BEHIND CATSJosh Hunt gathers it inside 50, he looks up at goal and can only manage a point. This is starting to smell of an upset, with the Dockers up and about at the moment. GOAL DOCKERSPavlich gets out on the lead and he takes a great mark 30m from goal. He loads up and kicks a goal. Team Cats need to get a move on as the Dockers look the more superior team at the moment. The Dockers have started the game off well, as they continue to run it through the wing. Welcome to the MCG for the First Elimination Final between Geelong and Fremantle. There are no late changes, with Simpkin the Cats sub and Suban the Dockers sub.